1) Preheat oven to 385 degrees. 2) In a large bowl sift flour, baking soda, nutmeg, baking powder, and salt. Set aside. 3) In another large bowl whisk together sugar, oil, cap-ful of vanilla, egg, and yogurt. Add thedry ingredients and stir to a count of 10. 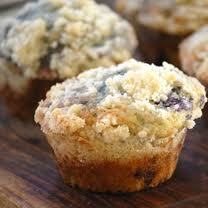 4) Add blueberries, reserving 1/2 cup, to mixture and stir 3 times. 6) Bake 20 to 25 minutes and allow to cool completely.